I'll admit, when I started reading this book I was a bit... miffed. Apprehensive. It's been a long time since I'd been in the Dresdenverse, and I'd been spending a lot of time in other universes. I was impatient for a new book. Waldo Butters steals the show as the new Knight of the Cross. Considering that he wields a sword that looks more like a lightsaber than a holy relic, it should come as no surprise that his first "Call" from the Almighty is quite a bit different from the still, quiet voice that pious Michael had heard. And who could deny the appeal of Anastasia Luccio subduing some bad guys out in the Old West with Wyatt Earp? and gives more insight to characters that Mr. Butcher has already fleshed out wonderfully. Thanks to Netgalley and the publisher for an advanced copy in exchange for an honest review. MORE DRESDEN! FINALLY! Okay, so, I'm not going to get into how much Butcher is driving me nuts over here with his newly found George R.R. Martinism. But I will say YAY, because finally more Dresden. Let's be honest here, though... most of these shorties were already released in other anthologies. Only one is new and original to this anthology. But, as someone who doesn't usually purchase many anthologies unless they are author-specific (like this one, or Faith Hunter's Jane Yellowrock anthology, or Patty Briggs' Mercyverse anthology) or they have at least two or three shorties by authors I already know and love... this anthology was a gem. I got all of these other shorties without the expense of buying many more anthologies with things I probably wouldn't love in them. :) And we got a brand new standalone story called Zoo Day. My favorite stories in this collection were the Molly stories, if I'm being honest. She's become a very interesting and easy to relate to character, and it was cool (pun intended!) to see things from her point of view. She's got a lot of challenges ahead of her now, and I think she's going to remain one of my favorite characters in the growing cast. I also really loved the Butters shorty. Seriously, I love Waldo "POLKA WILL NEVER DIE" Butters. I love all the nerdy references in his stories. Zoo Day was great... and we got to see some of the story from a VERY cool perspective... MOUSE! I loved it... and loved the quote from a dog's viewpoint: "That might be the hardest part of human heart-stupidity: how much happiness you simply leave aside so that you have enough time to worry." Ain't that the truth? The foo dog speaks truth! I liked being able to read all of the Bigfoot stories as well, and rereading Marcone's shorty Even Hand was fun too. Overall, highly recommended to help tide you over if you are jonesing for a Dresden fix, especially if you are like me haven't read most of these shorties. 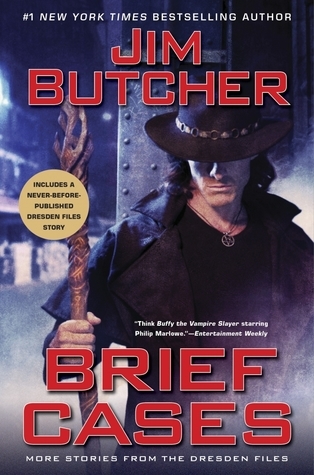 Brief Cases (The Dresden Files #15.1) by Jim Butcher is a book I requested from NetGalley and the review is voluntary. I have loved his books even before he had the TV show. I love the imagination, creativity, and the humor. This book is another one of those books! Several short stories creative characters and plots that kept me interested from beginning to the end. They also have just enough snark and wit! There were several stories about Bigfoot and a really great one about Dodge City and Mr.
Brief Cases (The Dresden Files #15.1) by Jim Butcher is a book I requested from NetGalley and the review is voluntary. I have loved his books even before he had the TV show. I love the imagination, creativity, and the humor. This book is another one of those books! Several short stories creative characters and plots that kept me interested from beginning to the end. They also have just enough snark and wit! There were several stories about Bigfoot and a really great one about Dodge City and Mr. Earp. But in that last story there were wizards and strange creatures to ride on that did not sound like horses! That was my favorite. A fun read. Okay, a review... ah, screw it. narrate this short story. My chief complaint? I WANTED MORE! Too short, but extremely promising. I'd listen to an entire series of her Wild West adventures. and I loved them then. Same rating. Still loved these short stories. Good, but not particularly memorable. Again, I just wanted more! Fun, fun, fun! Baseball fun. This was a great short. Jim Butcher did a great job narrating this! Loved hearing a story from Gentleman Johnnie Marcone's POV. I could use a whole book of this stuff. Very well done. LOVED Julia Whelan's narration and adored this new-to-me story from the POV of Molly. Exciting, fun, and dangerous enough to keep me on my toes. I want more, more, more stories from Molly's POV. Yes, yes, yes! Love you, Lady Molly. Very solid, awesome narration as always. Loved this complex story, excellent reading. What a way to end! I had a great time with this book. I knew that this was going to be a book that I would need to read as soon as I saw it. I have been a fan of The Dresden Files for quite some time so spending a bit of time with Harry Dresden and company was something that I was quite eager to do. I went into this book with pretty high expectations simply because I have come to expect great things from this series. I am happy to say that this book met every one of those expectations. Of the 12 stories included in this collection, 11 have been previously published. I was lucky enough to have missed all but one of the stories so almost everything was new to me. The one story that I had read previously was one that I really enjoyed the first time so I decided to go ahead and read it again and ended up enjoying it just as much the second time around. I loved how varied and original each of the stories were while giving me the taste of much loved series that I was looking for. Some of the stories feature Harry as the lead character but we do get the chance to see other characters take that role including Molly, Butters, Maggie and Mouse, and Warden Luccio. I loved getting the chance to see these other characters take the lead and enjoyed spending a moment hearing some of their thoughts. When I pick up a collection of stories, I have discovered that I will probably like some of the stories more than others. I usually come across a few that I don't really care for as well but that didn't happen with this book. I really liked all of the stories pretty equally and can honestly say that every story in the group is solid and if rated individually, I would give them all either 4 or 5 stars. I would highly recommend this book to others. These stories take place at various spots within the series but I think readers new to the series would appreciate this book. Fans that are up to date with the series will enjoy seeing favorite characters as we remember them. I can't wait to read more from this amazing series! I enjoyed this book of stories. Even though most of the stories in this collection have been previously published, I had only read one of them prior to picking up this book. I liked that there was a short introduction from the author before each story to set everything up. It was great to spend some time with Harry, Molly, Butters, Maggie, and the rest of the gang. (just published in June 2018) is a collection of a dozen short stories set in the world of Harry Dresden, a private investigator and talented wizard living in Chicago. Harry is the main character in most of the stories, but not all; a few other characters in Jim Butcher’s DRESDEN FILES universe get their chance to relate their adventures in their own voices. , a treacherous shapeshifting water spirit (usually in the shape of a horse) who lost a bet to her, and a particular deputy who will be familiar to anyone who knows anything about the Old West. I was tickled pink to meet him in this tale! , where the same period of time and overlapping events are related by Harry Dresden and two other characters, a young girl named Maggie (who will be familiar to readers of the series) and an enormous and magical dog ironically named Mouse. Harry, Maggie, and Mouse take a trip to the zoo one day, where several different magical threats turn up to disrupt what was supposed to be a pleasant outing. Each of these three characters offers his or her own perspective on the events of that day, building on each other’s stories. It was insightful and even touching. “B is for Bigfoot,” “I Was a Teenage Bigfoot” and “Bigfoot on Campus” are an enjoyable trio of stories about the son of Bigfoot by a human woman, a six foot-four inch archaeologist. Irwin, their son, is an intelligent and (understandably) physically strong young man, but has typical growing-up troubles with bullies, school teachers, and first love. Of course, there’s a magical twist to all of these problems. These stories explore some of the problems and concerns of parenting, with a Sasquatch spin. Another particularly memorable story was “Curses,” a tale with a distinctly Chicago flavor, which relates the “true” story of the Chicago Cubs and the infamous Billy Goat Curse of 1945. Bob the Skull makes an appearance here to good effect, helping Harry analyze the long-running curse. In addition, there are a couple of stories featuring Harry’s friend Molly (one of which, “Cold Case,” is a bleak and distinctly Lovecraftian tale set in Alaska); “Day One,” a story about Waldo Butters and his first outing as a Knight; and “Even Hand,” from the point of view of Gentleman Johnnie Marcone, a crime lord with ties to the magical underworld. are set at various points in the DRESDEN FILES series and, fair warning, there are some significant spoilers relating to things that happen to some key characters in some of the later books of the series. It’s also helpful to be at least somewhat familiar with the series before launching into reading these stories. I’m somewhat a newbie to Harry Dresden: so far I’ve read only the first and fourth books in the series, but that was enough to anchor me for these stories. Though these stories are fairly light action and mystery fantasy tales, there are deeper themes running through them. Butcher touches on some of these themes in his introductions to each story. , which is new, all of these stories have appeared in various previously published anthologies. is well worth reading for fans of the DRESDEN FILES series, but might be slightly confusing for readers who aren’t at least a little familiar with the Dresden universe and characters. I received a free copy of this ebook from the publisher through NetGalley. Thanks!! I remember a time when these nice short stories use to be fun little reads between the yearly main line books... instead of the only thing published for years. - This story is told three times from different points of view so I'll be rating them separately. - A touching short story about Dresden having to learn to be a father while also being him. Over all good if rather low threat. - The same story but this time from Maggie's point of view. This gimmick is a little tiring but the way Maggie sees the world is interesting enough to keep this story engaging. Butcher doesn't do a very good job of making kids talk and act like kids but it did make me want more stories from her point of view. -Again? :/ The same story for a third time but from mouses pov. At this point the premise has worn thin and Mouse as a character and the differences in his part of the story just weren't enough to carry it. - The Luccio takes on necromancers in the Wild West story. Honestly the worst of the short stories. This one being first was a really bad idea and gives a terrible first impression. — A Dresden Short story, and this one was really good. The mundane setup is fun and the supernatural payoff is really good. — Teacher Dresden as a framing device is pretty good and the story had a decent punch to it. — A neat little short story about Butters and his new (Jedi) Knight status. This one is really good but very short. -1 star due to length. — The Dresden, Wrigley Field curse story. I'm just not interested in Chicago Cubs and the story doesn't do anything to make me care. — A Marcone story, it's pretty good, but Marcone is one of those characters who's inner workings are better left a mystery. I kind of wish I hadn't read this story as I prefer not entirely understanding his motivations. — First of the Bigfoot trilogy. It's got some neat ideas in it but not a lot happens. — Second of the Bigfoot trilogy, it's easiestly the weakest of the three as there's barely any conflict in the story. — Last of the Bigfoot trilogy and the best of them. You can tell Butcher as an author and The Dresden Files as a world had really matured by this point. — A Molly short story where she's trying to fill the shoes of Dresden while he was 'dead'. It's pretty good. I think the idea behind this book is rather cynical. While collecting short stories published in other places together is a good idea (I'm not going to buy his rpg book to read one short story), More than half of the stories here were already collected in his short story collection books. 7 out of the 12 stories (MORE THAN HALF) are ones I'd read before. If I had bought the book instead of renting it I would have been very annoyed. Just be aware of what you're getting here. If you're a big fan and go out of your way to read his short stories, you're going to get almost nothing out of this book. If you've only read the main series stories, this is a good one to pick up. rounded down due to all the repeat stores. I already read most of these in other collections.